Nearly 25% of oil produced in the USA is from the Gulf of Mexico (GoM). This supports a vibrant coastal economy and culture. 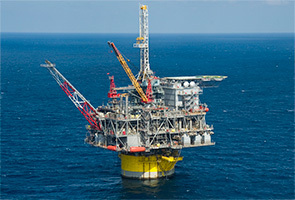 Shell has been operating in the deep-water GoM for over 30 years. Our platforms, including six major deep-water facilities, produce more than 400,000 boe a day on average each year. Shell’s share of this was over 180,000 boe a day in 2011. We continue to grow our business responsibly in this region. The Shell-operated Perdido project (Shell interest 35%) set an industry record in 2011 by drilling a well in more than 2,900 metres of water. Perdido is expected to produce 100,000 boe a day when it reaches full production. It was designed with extra capacity to produce potential discoveries in the area without expanding our physical footprint. We also took this approach with the Cardamom oil field in the GoM, which will be developed through our existing Auger deep-water platform. This is expected to add 50,000 boe a day to our production in the GoM by the end of 2014. A new deep-water platform, Olympus (Shell interest 72%), is under construction for the Mars basin in the GoM and is expected to add another 100,000 boe-a-day capacity when it begins to produce in around 2015. Our work in the region includes efforts to improve scientific knowledge of natural events that can have an impact on coastal communities dependent on the Gulf of Mexico for their livelihoods. We partner with the U.S. National Oceanic and Atmospheric Administration to provide information for hurricane research, forecasting and coastal management. Sensors mounted on some of our platforms help to chart the development of storms that could lead to coastal flooding.